Luke 12:48 Much is required from those to whom much is given, and much more is required from those to whom much more is given. Have you been listening to the speeches at the Republican national convention this week? 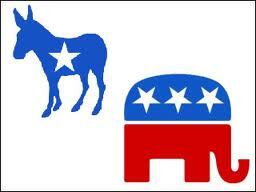 I have been learning more about the candidates from hearing the speeches and analysis on TV. Unless you are cut off from the media altogether, you can’t help but learn something about all of the candidates who are running for office in November, including the highest office in our land. I find it very interesting that the first Mormon is running alongside a born again Catholic against the first sitting African American President. Our times are certainly a lot different than one generation ago, aren’t they? Don’t worry. I’m not going to comment on Mormonism or Catholicism, nor am I going to encourage you to vote any particular way for any of the candidates. What I want to do in this D-mail is to remind you of the great privilege and duty you have as an American citizen to vote, and vote intelligently, for the people who will lead us in the coming years. I believe God charges us to gain as much wisdom as we can about the issues and candidates. In the next two months, there will be a plethora of forums from which you can gather information about the candidates and their stance on the many crucial issues set before America. I know that God wants us to pray for our country and the many candidates who are seeking office as well as for our fellow citizens who will be voting in November. I believe that God has given us the freedom to choose our leaders and the responsibility to choose wisely. Our vote can bring about good or it can support evil. The apostle Paul told the Ephesians (Ephesians 5:15-17), who were living in dangerous times as well, to be very careful how they lived. They were to live wisely amongst people who did not agree with their beliefs. They were to take every chance they had to do good to those people. He told them to learn what the Lord wanted them to do. At this time in our nation’s history, we need to elect those who will seek God for guidance and learn what God wants them to do for America. If you have not taken the time to learn about not only the candidates for President, but those who are running for Senate and House both at the federal and state level, now is the time to do it! Read newspapers from various biases, read the candidates’ websites, watch a variety of news programs on TV, listen to the radio broadcasts that can inform you. Tune out the mud-slinging and get to the real issues. It is your duty as an American and as a Christian. If you haven’t done your homework, how can you decide wisely for whom to vote? And if you don’t vote your conscience, then you will be responsible for the life you will be leading under a leader you don’t approve of. Luke 12:48b says, “Much is required from those to whom much is given, and much more is required from those to whom much more is given.” We have been given great freedoms in America and therefore, much is required of us as citizens to influence the future of our state, our country and even our world. Experience has taught us that much, hasn’t it? So, I charge you to do your homework before the first Tuesday of November. Take any opportunities to share your position as a Christian voter with others. And when November comes, I charge you to get out and vote – no excuses. If you don’t know where to look to find information on the candidates, please write to me. I can at least share with you the resources I have found to be helpful. At the end of my week at the Writers Confernce, my husband, Chuck, drove down to Green Lake to join me for a weekend at the Angel Inn B&B in Green Lake. It was his birthday and we celebrated by swimming, taking a boat ride around the lake, sipping wine on our lakefront balcony, eating out, going to a flea market and shopping for furniture. 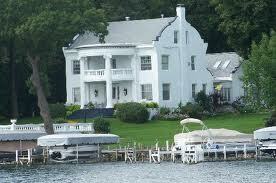 We highly recommend Angel Inn! Food was excellent, the owners were friendly and charming, and our room was luxurious. I’ll post some photos soon. The night of January 11th was bitterly cold. The only light inside the music building shone through the small window of the door to Laura Olson’s assigned practice room. She was practicing Bach’s Toccata and Fugue in E minor for her upcoming senior recital, but a sticky key was driving her nuts. Middle C felt dead under her fingers. Laura climbed up on the piano bench and stuck her right hand down into the works of the old upright. With her other hand, she struck middle C while she watched for its hammer to move. As she suspected, it wasn’t striking the string. “Hmm. Something must be stuck under there,” she muttered. Feeling around between the hammers, her fingers met with something squishy, like a soft, little pillow. “What the heck?” she muttered. She pulled her finger away and hit the key again. This time she noticed a little puff of dust as the hammer came down. She tried it again. Another puff. Grabbing a pencil from the music rack, she pried the thing out, only to have it elude her fingers and drop down between the hammers. On her tip toes, she thrust her hand into the works as far as she could reach and felt around. “Gotcha!” she said, when suddenly the doorknob rattled. She practically jumped a foot, nearly dropping the bag. Whoever it was started banging on the door. “OK, OK! I’m coming.” Climbing down from the bench she shouted, “Who’s there? “Good night, Laura.” Sterling interrupted, crossing his arms like a scolding parent. “ You didn’t find anything in there, did you?” His suspicious tone on top of his odd behavior was beginning to give Laura the creeps. “In the piano? No sir. Didn’t get the chance,” she said, trying to sound nonchalant. No sooner had she pulled the door closed behind her than she heard the lock turn. “That was weird,” she thought, a chill running through her body. “Something funny’s going on.” Her heart was pounding as she took the little bag from her pocket and examined it by the light in the hallway. It was a plastic bag about two inches square with what appeared to be some kind of white powder inside. Peering more closely, she noticed a split in the seam. Most of the white powder had leaked out in her pocket. 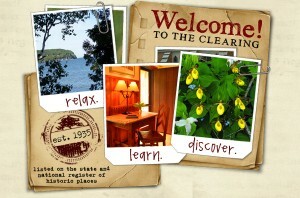 In early August I headed up to Door County, Wisconsin to a place called The Clearing. The Clearing is a folk school on beautiful wooded grounds where all of the arts are taught year round. 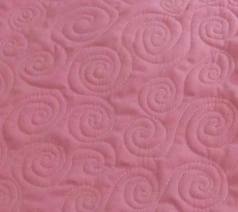 I took a two day class on free motion quilting on a home sewing machine. It was a small class with a knowledgeable and enthusiastic teacher. Free motion quilting is done on a regular machine with the feed dogs down so as to allow the sewer to move the fabric freely under the needle. It is a skill that requires a good machine, the right thread and needle, and a lot of hand-eye coordination! We learned to quilt all sorts of designs based on 5 basic shapes, the straight line, the S, the arch, the wave, and the squiggle or meandering line. It was hard! I managed a decent looking squiggle but the rest of the designs were tough. The trick is to balance the speed of the machine (ie. 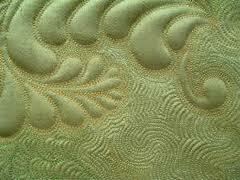 the foot pedal) with the speed at which you push the quilt sandwich past the needle. Too fast and you get teeny tiny stitches too difficult to see. Too slow you get big, sloppy stitches. Once you get your stitches the right size and consistent, you learn to push the fabric around with the palms of your hands in whatever direction your design is leading. My arches ( supposed to look like rounded m’s) were never the same size or width! The crests of my waves were too pointy or too rounded, too far apart, or too high. No two came out the same! I was completely exhausted and frustrated by the end of Day 1. 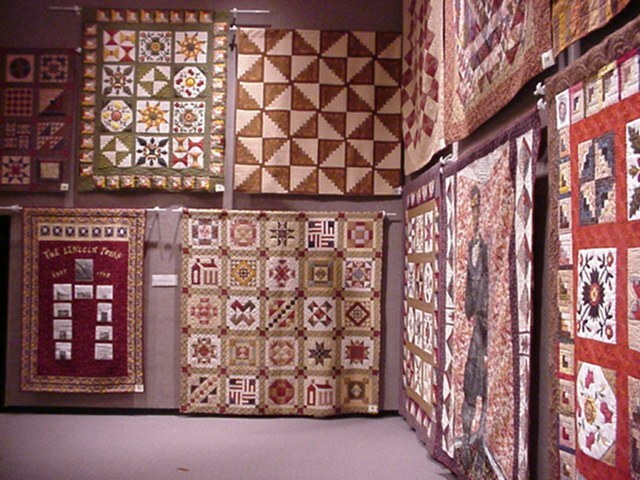 It didn’t help that the quilter across from, who had only been quilting less than a year, was amazing! Her shapes were consistent and actually looked like something recognizable. Day 2 was a little better, but I definitely needed many more hours of practice before I could actually tackle the real thing. The teacher was so supportive and we learned a lot about threads and creating our own quilt designs. The Clearing staff served 2 excellent lunches. I have been practicing some since then and now have all the tools that make free motion quilting easier (there’s always a new tool to buy, isn’t there?) 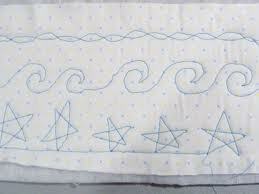 I am going to have a go at a baby quilt panel that I sandwiched and basted. I’ll try to remember to take a photo to post when I finish. You can find out more about The Clearing at www.theclearing.org They offer a lot of great classes (not just sewing classes). Why Don’t You Call Me? 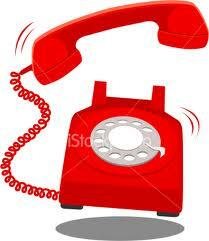 I think one of the greatest inventions since the telephone is Caller ID. The ability to screen the myriad number of telephone calls we get each day takes most of the annoyance out of the ring of the telephone. I can just let a call go unanswered as long as I know it isn’t a family member or close friend. No guilt, no running to the phone from the bathroom! These past months of the 2012 big election year have been the worst, haven’t they? I swear the Republican National Committee has called me twice a day for over 2 weeks – and they must be pretty persistent because I never answer! I can’t think of a single stranger I want to talk to that badly. We got such a kick out of this typical New York Jewish mother with her Brooklyn accent, but really, the longing in that mother’s voice was truly moving. When someone you love doesn’t make an effort to communicate with you, it really hurts. Sitting by the phone, waiting for the child I’m worried about, the child I have been fervently praying for, isn’t funny at all. I wonder if God is like Adam’s mother in a way. God, are you waiting by the phone for me to call? Do you show up every day during quiet time and wait for me to come? How many different times have you called out to me? How many ways have you tried to build communication with me and I haven’t responded? It feels strange sometimes I know to sit all alone in an empty prayer closet and try to hear the voice of someone we cannot see. It’s awkward at first to talk to the air, isn’t it? But God is there. He’s said so all through his word. He’s asked us to call. If you knew a dear friend would be sitting in the same place in the park every day, expecting to meet you and share all the best news and advice, you would go, wouldn’t you? God is that friend. They said of Jesus that he was a friend to sinners so even if you feel unworthy, he still wants to spend time with you. He is the best listener you’ll ever know. I awakened in sunlight, grip­ping the Bible, with muscles tense and nerves vibrating. Under the inspiration of this vision I wrote as quickly as the words could be formed the poem exactly as it has since appeared. That same evening I wrote the music. If you could walk and talk with Jesus and hear all the sweet words he had for you, wouldn’t you race to that place? My prayer for myself and for you is that this communion could happen every day for us. And the joy we’d share as we tarried there, none other would ever know. This week I spent two days taking a quilting class at a retreat center in Door County, Wisconsin. I must confess that I found the skill set we were taught to be pretty difficult. By the end of the first day, I was ready to pack it up and go home! It didn’t help that the lady sewing across from me picked everything up so fast! She seemed to have no trouble at all doing beautiful work. I was stressed out to put it mildly. Day two went better, but I still was on the verge of “falling to pieces” (that’s a quilting joke!). However, because I really want to be able to use these skills, I will have to discipline myself to practice them daily until I too can do work to be proud of – which is too bad since I thought I would master this stuff right off the bat! Anyway, on the drive home, I began to think about how our lives are like a quilt. 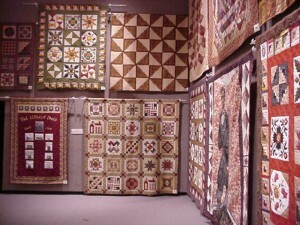 Except for what is called a whole cloth quilt, all quilts are made up of many pieces cut from various yards of cloth. When the pieces are sewn together in patterns, they become a quilt. When we look at a quilt, we recognize that it has been pieced from many shapes, yet we think of it as one whole blanket or covering. 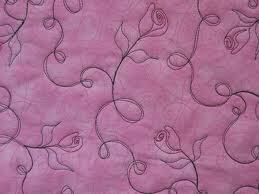 Sewn together properly, a quilt will function as something stronger than its many pieces. Any normal person is going to experience at least one time in their life when the stresses or tragedies they face will cause them to fall to pieces. In the middle of life’s tribulations, we wonder if we’ll ever be able to pull ourselves together again. Some of us never do. But there is a way to recover. The secret to pulling ourselves together again is to rely on God rather than ourselves! Only God, who knows what wholeness for each of us should look like, can pick up our many pieces and weave them back together until, like a quilt, we are stronger than before and more beautiful too. I never cease to be amazed how the stacks of fabric pieces I have cut from a dozen colors and designs, come together to make a beautiful and functional piece of textile art, which is the quilt. In the same way, I am amazed to see how God can take a broken, frazzled human being and knit them back together into someone whole, strong, and more beautiful than before. In Psalm 7 we find David crying out to God as a man who has most certainly fallen to pieces despite the fact that God has anointed him the next king of Israel. Are you at your wits end? Have you fallen to pieces as a result of stress or tragedy? Do you feel lost, without direction? Do what David did. Fall into the arms of God and ask him to sew you back together again.